Aggressive and distracted driving have been contributing factors to an increase in the amount of pedestrian fatalities due to auto accidents in the City of Chicago. 46 pedestrians lost their lives in 2015 and many more were injured in accidents involving drivers that were speeding, texting and driving or acting in a reckless or aggressive manner on the roads. These figures are 31% higher than the same data for 2014 and contradicts the belief many have that the city has made substantial progress in improving the safety of city roads for pedestrians. While the enforcement of laws plays a role in deterring motorists from negligent behavior, it is ultimately the responsibility of drivers to do their part in preventing needless injuries and deaths. When attempting to determine what factors have had the most influence in the sharp increase in pedestrian fatalities, officials have noted that there has been an increase in pedestrian traffic throughout the city. Much of this can be attributed to the fact that more people are choosing to use public transportation measures such as buses and rail. The CTA served over 515 million passengers via its rail and bus services. Residents are also opting to walk or bike to their destinations. There has been a 14% increase in foot travel since 2010 and 55% increase in bicycling over the same period. How this factors into the increased risk of pedestrian fatality is simple volume. With more people traveling by foot or bicycle, there are more people crossing streets on foot or walking near moving vehicles. More motorists are choosing to travel across the country as well, increasing the number of vehicles present and the miles traveled. This has resulted in the recipe for the perfect storm— with more drivers and pedestrians on the roads and an increase in driver distraction and aggression. While many newly manufactured vehicles feature advanced safety features that may prevent accidents, they also include numerous features which may distract drivers and make them more likely to strike pedestrians when their attention is diverted. Touchscreens, Bluetooth connectivity and infotainment systems often divert drivers’ eyes from the road in order to perform desired functions and the ongoing concern over texting and talking while driving remains prevalent. Distraction is a factor in an overwhelming majority of accidents. Distracted drivers are more likely to be unaware of local speed limits, placing victims at a higher risk of suffering serious injuries due to collisions at higher speeds. The very technology that is meant to simplify our lives and keep us connected to the world around often becomes the source of catastrophe. The need for instant gratification has permeated our society, resulting in driver and pedestrian impatience. Everyone is in a hurry to reach their destination and heavy traffic frustrates motorists; who in turn make aggressive moves to get through or around the traffic that is in their way. It is an unfortunate reality that many of the drivers who act recklessly fail to take responsibility for their choices. 45% of pedestrian fatalities involve a hit and run driver. Slowing down and exercising patience is the most effective way to reduce your chances of being involved in any form of accident. Pedestrians themselves can be an influencing factor in accidents if they choose not to cross at controlled intersections or fail to look for oncoming traffic before entering the roadway. Two in three pedestrians hit by a vehicle were within 50 feet of an intersection’s midpoint, suggesting that some pedestrians may have attempted to cross the street without waiting for the light to change. City officials have begun to investigate whether traffic signal patterns and the locations of intersections play a role in pedestrian accidents. Numerous incidents reported at the same crossroads may indicate the need to evaluate whether the intersection itself needs to be redesigned in order to protect pedestrians and reduce the risk of injury. 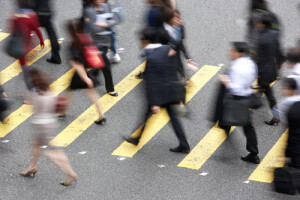 Pedestrians struck by motorists are entitled to compensation for the value of their medical bills, lost wages, pain and suffering, out of pocket expenses and more. Families of pedestrians killed in auto accidents may also be entitled to recover damages through a wrongful death lawsuit. If you have been injured or lost someone you care about in an accident, it is important to consult with a qualified attorney to learn more about your legal options. Contact Rosenfeld Injury Lawyers LLC today for more information.